The Spanish Association of Business Schools is a quality assurance standard of Spanish business schools. Its members share the goal of providing Professional Masters that allow executives training who can improve business efficiency. The Spanish Association of Business Schools is associated with the CEOE (Spanish Confederation of Business Organisations), as representative of the sector employer of Spanish business schools (the CEOE is the largest Spanish institution of employers and leading business lobby). 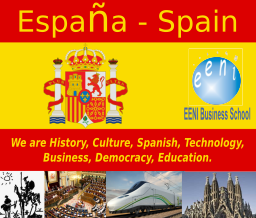 EENI Business School & HA University, like a member of the Spanish Association of Business Schools, is part of the official foreign promotion campaigns of the Ministry of Education, Culture and Sports of Spain and ICEX. ICEX “Spain Trade and Investment” is a public company whose mission is to promote globally Spanish companies and attracting foreign investment to Spain. The Spanish Association of Business Schools serves as partner dialogue between the business schools and Spanish Government, companies and other Spanish or foreign institutions. Website AEEN (Only in Spanish).